Azlan Shah Kamaruzaman made a big comeback to the FIM Asia Road Racing Championship with a double victory in the season opener held at the Johor Circuit on April 1 and 2, 2016. The Malaysian rider followed up his commanding performance in Race 1 with an unexpected change of tyre strategy. Even though the soft compound rear tyre netted him good results on Friday, Azlan opted for the hard compound for Race 2. With track temperature close to 55 degrees Celcius, the choice was disadvantageous at the start of the race. Pole-sitter Zaqhwan Zaidi and Yuki Takahashi both opted for soft compound rears for Race 2. The MUSASHi Boon Siew Honda duo were quick to capitalize on their prime starting position on the front row. However, Azlan was never far behind. As the 16-lap race progressed, tyre wear rapidly became a serious issue. Takahashi was content to stay in third place, allowing the two Malaysians to battle it out in front of their home crowd. In trying to fend off constant attacks from an increasingly aggressive Azlan on the final lap, Zaqhwan committed a critical error on Turn 3. As Zaqhwan ran wide, Azlan raced through and held the lead right to the chequered flag. Azlan brought the flag down at 24’56.627s, followed by Yuki Takahashi second with 24’57.612s. Zaqhwan recovered fast enough to squeak through onto the podium in third place. “I was playing it safe at the start. I had identified Turn 3 as one of the possibilities for an overtaking move. My patience paid off when Zaqhwan ran wide right on cue. This double win was unexpected and I have my new team to thank for it,” said Azlan. 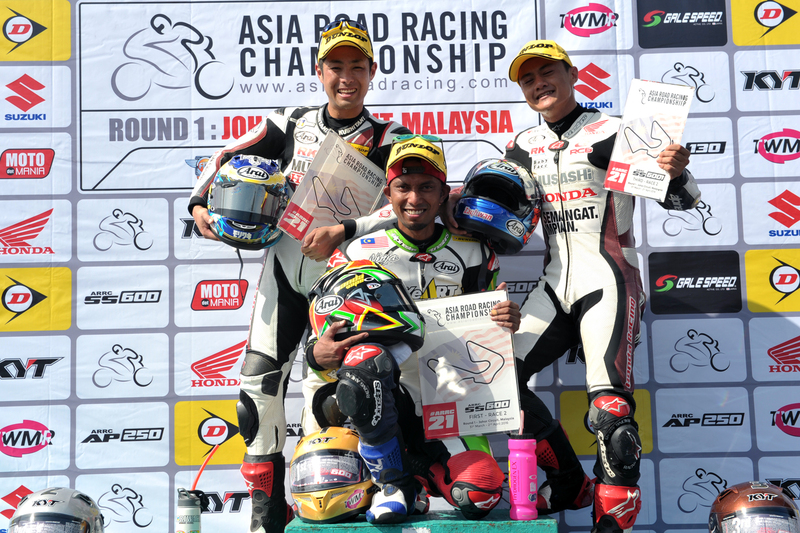 Behind the leading trio, former Asia Dream Cup rider Gerry Salim rode an impressive ride in fourth place. The young Indonesian rider successfully edged out Tomoyoshi Koyama, Ahmad Yudhistira, Dimas Ekky Pratama and Anthony West. Maximum points from Race 1 has Azlan leading the SuperSports 600cc title chase. Zaqhwan Zaidi is currently second overall with 32 points and Tomoyoshi Koyama’s consistency placed him third in the rankings with 31 points. The Asia Production 250cc Thai riders continued to demonstrate that they had their tag-team strategy down pat. In Race 2, Yamaha Thailand Racing Team trio Apiwat Wongthananon, Peerapong Loiboonpeng and Anupab Sarmoon, put up a strong defense wall at the front of the 28-rider grid. Starting the race from the front of the grid, the three team mates produced a near-perfect display of team work as they alternately towed and slipstreamed each other throughout the 12-lap race. The Thai riders dominated the top five spots on the timesheets – Apiwat in first place with 21’25.861s, Peerapong in second with 21’27.112s and Anupab third with 21’27.269s. Indonesian rider Galang Hendra Pratama punched his way through a huge second pack to finish fourth with 21’27.621s. Suhathai Chaemsap, returning to the ARRC on a 250cc wildcard ticket, also gave a good performance in fifth place with 21’28.014s. Like Azlan Shah in the SuperSports 600cc, Apiwat’s double win has given him a big advantage in the championship standings. He leads by a 10-point margin against Peerapong Loiboonpeng. Meanwhile, Johor-born Kasma Daniel Kasmayudin initially enjoyed a good run among the leading pack, but was soon engulfed by a swarm of riders in the second half of the race. Kasma eventually finished eighth behind Yusuke Nakamura and Takehiro Yamamoto. 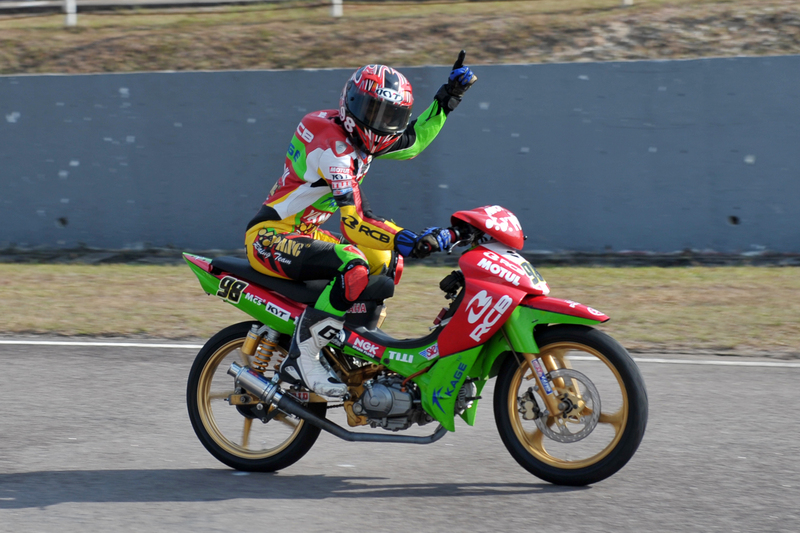 Finally, 21-year-old Mohd Izzat Zaidi professed surprise when he defeated more experienced Underbone 130cc riders to win Race 2 in the opening leg of the 2016 FIM Asia Road Racing Championship at the Johor Circuit. As always in the Underbone 130cc class, the riders spent seven out of eight laps jockeying for position at each corner. When the race intensified in the last lap, Izzat timed his break out of the last corner slipstream to perfection. The RCB KAGE Motobatt YY Pang rider slingshot into the win with a time of 15’32.282s. Senior rider Norizman Ismail claimed second place with 15’32.420s and FELDA PB Racing’s Iqbal Amri Malik took third spot with 15’32.455s.